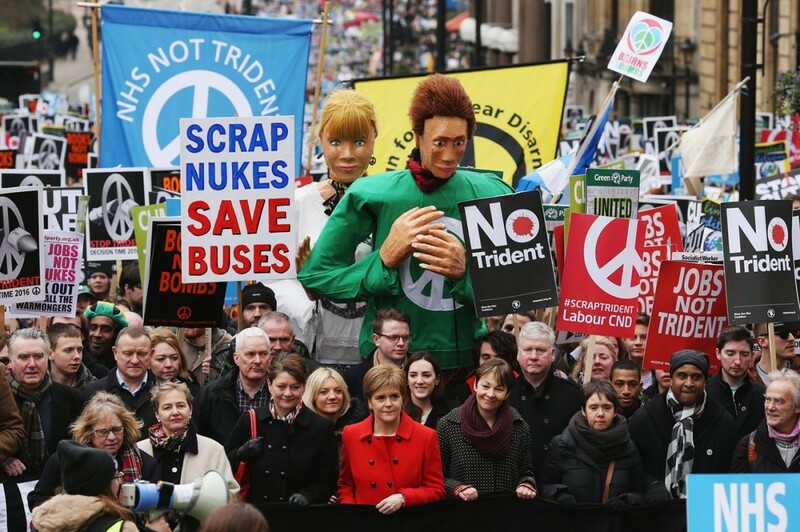 Leanne Wood, Nicola Sturgeon and Caroline Lucas join protesters on the anti-Trident march. Thousands of protesters have assembled in central London for Britain’s biggest anti-nuclear weapons rally in a generation. Campaigners gathered from across the world: some said they had travelled from Australia to protest against the renewal of Trident. Others had come from the west coast of Scotland, where Britain’s nuclear deterrent submarines are based. As the huge column of people began moving from Marble Arch after 1pm, the mood was buoyant and spirited despite the cold. Many waved placards with phrases including “Books Not Bombs”, “Cut War Not Welfare” and “NHS Not Trident”. 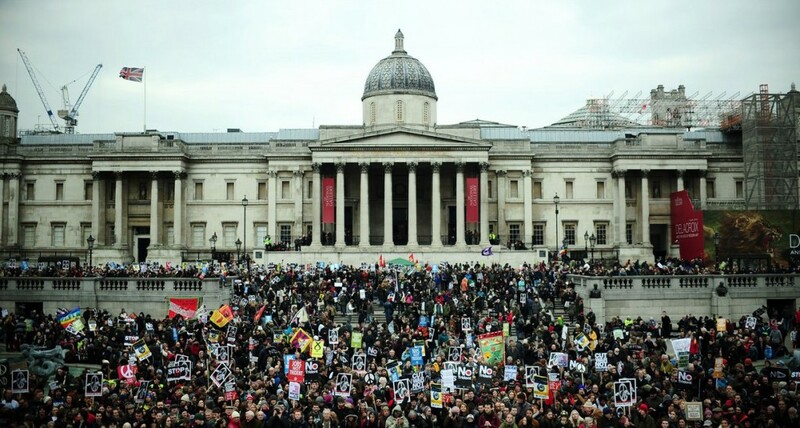 A common theme among protesters was the cost of renewing Trident during a period of austerity. The campaigners headed for Trafalgar Square where were addressed by the leaders of the SNP, Plaid Cymru and the Green party. The true draw – cited as an inspiration by many of those assembled – was the leader of the Labour party, Jeremy Corbyn, whose unswerving unilateralist stance has electrified the nuclear deterrent debate in a manner few could have foreseen. Entering the stage to rapturous applause, he said that no one should forget the “absolute mass destruction on both sides” that would follow a nuclear attack and reiterated his “total horror of nuclear weapons, should they ever be used by anybody”. Corbyn said he was elected Labour leader on a manifesto in which standing against the renewal of Trident was a key component. The treaty had worked, given that most countries that did not have nuclear weapons at that time had not subsequently acquired them, Corbyn told the crowd. It was a credit to countries such as Argentina, South Africa and Brazil that both Africa and South America remained free of such weapons, he added. The US, Russia and the UK signed the treaty, pledging their cooperation in stemming the spread of nuclear technology.